For Jan Cheshire, good cooking starts in the garden with fresh, seasonal vegetables, herbs and fruit. Jan shares food tips and some of her favourite recipes. If you've got your own favourite seasonal recipe or food tip, join in the conversation and email the Bass Coast Post. I MUST admit I’m not very good at cooking pancakes. In fact, I had sort of persuaded myself that I didn’t actually LIKE pancakes! However, my grandchildren love them and as they are threatening to come to stay during the next school holidays, I thought I had better be prepared. 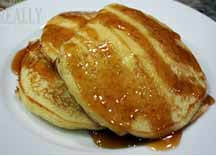 These are very simple to make and, I must admit, I really liked them, with lots of maple syrup of course. You can buy 600ml packs of buttermilk in the milk fridge at the supermarket. Mix the egg and milk and add to the sieved mixture, stir until well mixed. Heat a non-stick frying and add 1 teaspoon of butter. Pour in the some of the batter to the size you wish for the pancake. Cook until the pancake is very bubbly on the top and the edges start to crisp, then turn to cook the other side. Serve with berries and maple syrup for something special. ​WE LOVE to eat fish, however we don’t get much variety in the supermarkets around this area, so I try to cook a few different fish dishes from time to time. This is one of the best fish pies that I have ever made and is a very easy and economical recipe. Gently poach the fish in the coconut milk together with the lemon juice and zest, parsley and chives, if using, and a splash of olive oil for 5 to 8 minutes. Cook the celeriac together with the thyme and potatoes for 20 minutes until soft. Drain and mash together with a little butter, season. Put the fish in a baking dish, pour over the poaching liquid. Top with the mashed celeriac and potatoes. Bake at 180 degrees for 30 to 40 minutes until golden on top. I’M going back to the seventies with this dish. Recently, I was throwing out some old recipes which I have had for years, the paper all yellow; some torn beyond recognition, some spattered with whatever sauce I was making at the time. I decided I had to keep some of my all-time favourites and type them up on the computer for posterity. This is a delicious recipe from my early days in Australia, when I was obliged to do a fair bit of entertaining. I have no idea where it came from, but I think I found it in a 1970s English magazine. It withstands the test of time and makes a very tasty dinner for all the family, or for a special meal with friends. This will serve six. Lay chicken breasts flat on a board, cut across into strips about ½ inch thick, and toss the chicken in flour. Melt half the butter in a pan, add onion and bacon and cook until tender, then add mushrooms. Put onion, bacon and mushrooms into a casserole dish. Melt remaining butter and fry the chicken until pale golden brown. Transfer to the casserole dish. Stir stock and wine into the pan juices. Bring to the boil stirring. Add salt and pepper and mixed herbs. Pour into the baking dish, stir, and cover with a lid. Cook in the oven for 45 minutes. Remove from the oven and stir in the cream. Cover and cook for a further 15 minutes or so. Serve with rice and a green salad and a nice bottle of riesling! MY LOVELY niece in Canada sent me this recipe last year. I had never heard of pumpkin spice biscuits before. This year we have had our usual crop of “feral” pumpkins, so I plan on making these delicious, spicy biscuits very soon. Although they don’t look very inspiring, I’m sure you will enjoy them as much as I do. Preheat the oven to 180 degrees. Grease and line a tray with baking paper. Cream the butter and the two sugars. Add the beaten egg with the vanilla essence. Next the cooked and pureed pumpkin. Then sift the flour with all the spices and the salt and baking powder. Add to the biscuit mix and stir well. Using a dessert spoon, dollop the mixture onto the greased and lined baking tray. Mix the sugar and cinnamon and sprinkle over the biscuits. WE HAVE had such an overabundance of vegetables this summer that it has been hard work finding recipes to deal with it all. In particular, the tomatoes are still going strong, but so are the eggplants. We only had a few last year, but this year they have gone crazy!! This recipe uses all those vegetables and is particularly delicious into the bargain. If you are not sure about the “vegetarianism” of this dish, you could always barbecue a couple of good steaks to go with it. Cook the eggplant over medium heat for 8 minutes until golden brown. Remove and drain on a paper towel. Add carrots and celery to the pan and cook for 8 minutes and remove to a paper towel. Add the Risoni and tomato paste and cook a further 2 minutes. Mix well and put into a 21 x 27cm rectangular baking dish or 27cm diameter round dish. Arrange the tomatoes on top and sprinkle with the dried oregano, salt and black pepper. Bake for 40 minutes until pasta is cooked through. Remove, leave to settle for 5 minutes and serve. RECENTLY, I was wracking my brain to find a different but easy salad to take with me to the Woolamai Picnic Races. I am not sure how this one cropped up, but I thought I had better try it out on Bert first. Hooray, it was a great success! I don’t usually like salads with noodles, but this one is particularly tasty and, of course, very easy to make. Cut the chicken thighs into manageable pieces. Pierce them with a metal skewer. Marinate them in the chilli jam, preferably overnight or for a few hours. Heat the olive oil and char grill or pan fry the chicken turning often until cooked. Plunge the noodles into boiling water for 2 minutes, drain and cool. Wash the bean sprouts, herbs and any other salad items. Mix all the salad ingredients into a bowl. Add the cooled noodles and cooked chicken pieces and toss well. To serve, pour over the Thai style dressing. 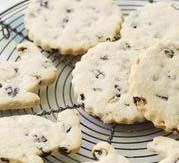 Shortbread is a bit of a tradition with us at Christmastime, they are so easy to make, taste delicious and are very moreish. You can’t have just one, I’m afraid! These ginger shortbreads are especially delightful. Mix together the butter, flours and sugar. Roll out the dough to about 1.5cm thick. Cut the dough into 18 fingers. Grease and line a baking tray and place the fingers on the tray leaving a little space between each. Bake on trays for 25-30 mins at 160. Sprinkle with a little caster sugar when cooked. LATELY we have been cutting down on red meat and eating more chicken. It is so versatile and I have many recipes. This one was new to me and I thought I would give it a go because we have quite a lot of sage in the garden. I was very pleased with the results. NOT only did we have a great crop of apples this year but the rhubarb has been wonderful as well. In fact, we have had to remove some of our older plants to make room for other things! As you can imagine, I’ve been making rhubarb crumbles, tarts and cakes, etc. We really enjoyed these sweet muffins and the raspberries give them a bit of oomph. 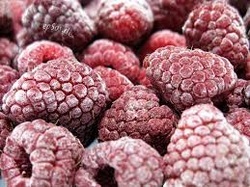 They’’re very easy to prepare and freeze well. These make a nice little treat for morning tea. Sift flour and 1/4 teaspoon cinnamon into a bowl. Add the sugar and stir to mix. Make a well in centre and add the butter, buttermilk, egg and vanilla. Using a large metal spoon, stir gently to mix. Mix 1 tablespoon of sugar and the remaining cinnamon in a bowl. Stand in pan for 5 minutes. THIS is a real winter warmer. Yes, the cocoa powder is a bit unusual, but it makes quite a difference. The chilli dish seems to me to be a lot smoother and silkier with the addition of cocoa. The combination with avocado is lovely too. Go for it! Make it a bit hotter (or milder) if you like. It’s always a great favourite with all the family. Cook the onion until translucent, add the minced beef and cook for 4-5 minutes, until browned. Reduce heat to medium and stir in tomatoes and tomato paste, cocoa, chilli powder and oregano. Divide the rice among dishes. Top with the chilli beef then the avocado. Serve with boiled rice and garnish with coriander and corn chips if wished. ​THIS time of the year is great for picnics. These eggs make an excellent contribution to any picnic and will be very popular. I hadn’t made them for ages, but they are really quite simple. I baked mine as I do not have a deep fryer these days. They turned out to be very good indeed. You can make these the day before and refrigerate them. Preheat the oven to 200°C. Line a baking tray with parchment paper. Place 6 of the eggs in a large pot of cold, salted water. Bring to the boil, then immediately reduce it to a simmer and cook the eggs for 8 minutes. Run the eggs under cold water from the tap, peel and set aside. Put the flour in a shallow bowl or plate and season. Break the remaining egg into a second bowl and beat lightly. Place the breadcrumbs in a third bowl or plate. Squeeze the sausage meat out of their casings into a bowl. Add the fresh thyme and parsley, if using, and mix them through the sausage with a fork, stirring well until they’re mixed. Scoop out a large ball of sausage meat and flatten it into an oval shape in your hand. (The sausage mixture will probably be quite wet and sticky to work with so flour your hands first. Wrap the sausage meat around the egg, pinching it together at the seam, then smoothing the meat around the eggs, making sure there are no gaps where the egg is peeking through. Dredge the sausage-covered egg in the flour, tapping off any excess. Dip each one in the beaten egg, making sure it all gets coated, then roll in the breadcrumbs, making sure it’s fully covered. Place the finished egg on the lined baking sheet, then repeat with the remaining eggs. Place the eggs in the oven and cook for 25 to 30 minutes, until the breadcrumbs are crispy and the sausage is cooked through. Scotch eggs can be eaten warm, cold or at room temperature. IT'S that time of the year once again. Those long, hot (let's hope not too hot) summer days beg you to ask a few friends around for a barbecue. These two very easy recipes should help with the nibbles. The dip is a favourite of mine because it’s so simple and tastes great. The chickpea nibbles go down well with everyone because they are not too spicy. They are actually quite good for you! I sometimes snack on them during the day. Put the feta and cream into bowl and mash. Add seeds if using, mint, chives and lemon juice and season. Stir with fork till well mixed. Cover and refrigerate for 3-4 hours before serving with a couple of mint leaves on top. Heat oven to 180 degrees, line a baking tray with baking paper. Dry chickpeas well with a clean tea towel or paper towels. Mix with the whole almonds and walnuts if using. Add half of the oil and toss well. Sprinkle over paprika, curry powder and half of the salt. Toss well and transfer to the prepared baking tray. Bake for 45 minutes tossing lightly every 15 minutes. Cool a little and put into a large bowl. Stir in the honey and remaining oil and oregano and toss to coat. Return to the tray, sprinkle with remaining salt and cook for 10-15 mins until golden and crisp. Merry Christmas to all Bass Coast Post readers. THESE kebabs have always been a special favourite of mine. I did them recently for a small dinner party and they were very popular. The satay sauce needn’t be too hot but for extra spiciness add a teaspoon of chilli paste or a pinch of chilli flakes. First of all cook the rice and keep it warm. Heat the oil in a pan and cook the onions slowly until they are soft. Add the garlic and cook for 2 minutes while stirring. Cook for another 5-6 minutes until thickened slightly. Transfer the satay sauce to a dish and then turn the chicken to lightly coat. Thread the chicken cubes onto the skewers (about 4 pieces to a skewer) (or you can thread the skewers first and then turn them in the sauce). Drizzle with a little oil and grill for 8-10 minutes turning frequently until they are lightly browned. Serve the chicken on top of the rice. Pour the satay sauce over the chicken and rice. Drizzle with a little warmed honey if liked. Making your own muesli is very easy and a lot healthier than some cereals. It will seem a bit expensive the first time buying all those nuts, seeds and dried fruit but for some time thereafter you will have the ingredients you need. I often get my muesli supplies at the Dandenong Market, where dried fruits and nuts are a lot cheaper than in my local supermarket. This is not an exact recipe – you can increase the amounts and put whatever you like in your own muesli, eg. chia seeds, goji berries, dried banana, dried apples, cherries, pears, peaches, vanilla essence, sesame seeds. Just make sure you give it all good shake to mix everything well. 1 tablespoon ful of LSA mix (available from the health aisle in the supermarket). Mix well together and keep in a sealed container. Eat with yoghurt and/or milk. I enjoy the crunch of toasted muesli. Use your usual mix for this. Line a large tin (I use an old roasting tin with deep sides) with baking paper. Put all the oats, seeds, nuts, and bran into a large bowl. Omit the dried fruit for now. Heat 3 tablespoons of honey gently in the microwave and pour over the mixture. Mix well and transfer the mixture into the tin and put into the oven. Bake on the lowest shelf for 25-30 minutes. The degree of toasting is up to you. Stir this mixture every 5-6 minutes so nothing gets scorched. When done, cool, add the dried fruits, mix well and store as above. RECENTLY, we spent some time up north to enjoy some winter sunshine while you were all trying to cope with some really bitter winter weather here in Bass Coast Shire. We stayed in a small town on the northern NSW coast. This place has a fish co-op where the fishermen bring their catch each day. Although the fish is not much cheaper than we pay here, at least you know it is fresh. This recipe was given to me by the lady who runs the sales part of the co-operative. This serves four people, but I cheated a bit and still bought 12 prawns for two people! It was delicious! This makes a lovely special dinner. You need quite a large frying pan for this unless you are lucky enough to have a paella pan. Or a smaller, deeper pan might work. In a pan, cook the onion on a low to medium heat until beginning to soften. Add the chorizo and cook for 2-3 minutes until the juices start to run. Add paprika and saffron (if using). Add 4 cups of the chicken stock. Reduce the temperature to low and cook uncovered without stirring for 15 minutes. Increase the temperature to medium and cook 4-5minutes more, adding extra stock if necessary. Season well and add the parsley. Cover the top of the pan with a clean tea towel and rest for 10-15 minutes. Serve the paella with lemon quarters for squeezing. 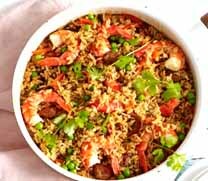 *If you prefer, you can use cooked prawns, in which case stir them into the rice about 5 minutes before the end of the resting period, just to keep them warm. WE had lots of pumpkins this year. They are such a versatile vegetable. I’ve made lots of pumpkin soup, even a pumpkin Rogan Josh curry, which I may add was delicious. However, with my three grandchildren coming down to Cape Paterson for the school holidays, I thought I should make a cake, and a pumpkin fruit cake was the logical choice. I have made this recipe many times and it is always a winner. It is very easy to make and it keeps well. Add the pumpkin and flour. Transfer to a greased and lined 23 cm loose-bottom cake tin. Bake at 160 degrees for 2 hours. I LOOK forward to winter, and I especially like making all those lovely winter soups and stews; I think I might have mentioned that before. Cauliflower is becoming one of those “trendy” vegetables these days, and it is indeed good for you. I have never been fond of it just plain boiled. This is a delicious, heart-warming soup which I really do enjoy and I am sure you will too. It is quite impressive for a special dinner, too, dressed up with some crisp bacon pieces. Cauliflower is a member of the cruciferous family and contains nutrients that fight against several diseases, including cancer. This often-neglected vegetable also contains vitamin C and folate. Just three florets of cauliflower a day will provide you with 67 per cent of your daily vitamin C requirement. When you’re buying cauliflower, make sure the tops are white. If it has begun to spot, it’s past its nutritional peak. Add the celery, onion and garlic. Cook, stirring for 3-4 minutes until softened. Add the potato, chicken stock, bay leaf and the cauliflower. Bring to the boil, reduce heat to medium low and simmer for 12-15 minutes or until cauliflower and potatoes are tender. Remove from the heat, cool slightly, then transfer to a blender and blend until smooth. Stir through the cream and half of the parmesan, season to taste. Serve topped with crispy bacon if liked then top with the rest of the parmesan, some chopped parsley and a little grated nutmeg and finish with a drizzle of oil. IT’S autumn once more, my favourite time of the year, and it comes with all its goodies from the garden. 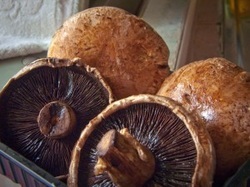 Pumpkins, apples, figs, sweet corn, quince and one of our great favourites – mushrooms. I like the flavour of portobello mushrooms and they can be good just fried in oil or butter as an accompaniment to a main meal. This recipe could even be a meal on its own with a couple more mushrooms. The mushrooms go very well with a nice juicy steak or lamb chops. I receive praise for it every time I cook it. It’s an old Jamie Oliver recipe which I have tweaked a bit. Pound the thyme, chilli (if using) and a little of the garlic in a mortar and pestle if you have one. If not, crush with the back of a wooden spoon. Mix in the lemon juice and add the olive oil. 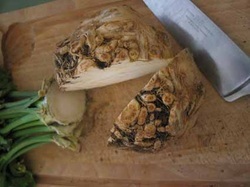 I usually remove the stems and chop them up and cook them with the mushrooms but you can leave them intact if you wish. Rub this mixture over the mushrooms and make sure you use all the oil. Tightly pack the mushrooms bottom side up in an ovenproof dish or roasting tray. With a knife make 2-3 little slits over each mushroom. Insert a slice of garlic into each slit. Dot the butter over the mushrooms. Season and bake for around 15-25 minutes. Sometimes I crumble some feta cheese or goat’s cheese over the mushrooms and let them bake for a few more minutes. Enjoy – and a happy Easter! MY PLUM lady on the Cape Paterson Road has sold her property so no more bags of plums for $3 and no more jars of plum jam. On the bright side, plums seem to be cheaper this year and I do so adore them. This is a wonderfully simple and delicious dessert you can make with plums or rhubarb. Place in a saucepan with 3 tablespoons of water and the caster sugar. Cover and cook over a medium heat for 10-20 minutes, stirring occasionally, until the fruit is meltingly soft. Transfer the fruit to a food processor or blender and process until smooth. Place the purée into a bowl and set aside until cooled to room temperature. When the plum purée is cooled, mix in the kirsch. Pour the cream into a large bowl and whisk until it forms soft peaks. Fold a little of the cream mixture into the plums, then fold the plums into the cream. 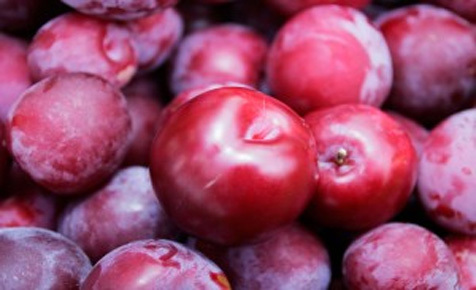 If the plums are very sweet, add lemon juice to taste, or if they’re a little sour, add extra sugar to taste. Chill, covered, for 15 minutes or until ready to serve, then spoon into elegant dessert glasses. It’s broad bean time again, and we have a wonderful crop as usual. We have spent most afternoons this week podding them, freezing them and of course eating them, along with the peas that Bert grew. It’s always a bit of a challenge to use them up, but they do freeze well and last a few months in the freezer. However, I really love them cooked then cooled and served in a salad. This one is especially nice. Steam the beans for 3 minutes and the peas for 2 minutes and put in a bowl to cool. Cook zucchini in a frying pan with a little oil. Add to the bowl and cool. Add zest, mint and feta. Whisk the lemon juice and olive oil and season. Pour over the vegetables and toss well. THIS cake is light and airy and very delicious. You could make it with other berries, but the blueberries, which seem to be a bit cheaper this year, blend very well with the lemon curd. You can buy the lemon curd or make it. The recipe is very easy. Grease a 23cm loaf tin and line with baking parchment. Put the yogurt, the lemon curd, the butter, eggs, lemon zest, sifted flour and caster sugar into a large mixing bowl. Scrape half the mixture into the prepared tin. Weigh 85g blueberries from the punnet and sprinkle half into the tin, scrape the rest of the batter on top, then scatter the other half of the 85g of berries on top. Bake for 1 hr 10 mins to 1 hr 15 mins until golden, and a clean skewer inserted into the centre comes out clean. Cool in the tin, then carefully lift onto a serving plate to cool. This literally takes 5 minutes and is scrumptious. Mix butter, sugar, juice and rind in a suitable microwave bowl. Microwave uncovered on high for 2 minutes until melted, stir once during this time. Beat cornflour and eggs together. Gradually beat in ¾ cup of water. Whisk into the lemon and sugar mix. Microwave uncovered for 5-8 minutes, stirring 3 times during cooking. IT WILL soon be time for Halloween. When I lived in southern Ireland many years ago, October 31 (All Hallows Eve) was very popular with all the children in the village where we lived. After school was overthe local children would dress up as ghosts or monsters and go around knocking on doors and offering “trick or treat”. Of course I would have laid by a few bags of lollies, and when they ran out I would offer apples to the would-be scary creatures. It was a great deal of fun all round. I notice over the last few years that Halloween has become very popular here in Australia, too, although we don’t get may “trick or treaters”. This Barm Brack is really a tea bread and it was the traditional cake made in Ireland at Halloween. It is very simple to make and quite delicious. I hope you enjoy it. Mix the fruit and hot tea and leave for 3 hours or overnight. Grease and line a 25x11cm loaf tin. Stir the egg and sugar into the fruit and tea mix. Sift the flour and baking powder with the spices. Add to the fruit mix, stirring to combine. Bake for 1 hour and 35 mins until a skewer inserted into the cake comes out dry. SOME time last year I posted a recipe in the Bass Coast Post for blood orange marmalade. Blood oranges are very plentiful this year in the supermarkets and I have just made another batch of the marmalade as it is very much a favourite in our house. I often give some of my home-made marmalade away to friends. However, there is always some left over and when it is just the two of us we don’t get through it very quickly. This is the reason I make this lovely marmalade and ginger loaf. It is very delicious and tangy and very easy to make. You can use any sort of marmalade for this. Grease and line a 21x11cm loaf tin. Sift the flour, baking powder, cinnamon and ginger. Cream the butter and brown sugar until soft. Add the lightly beaten eggs alternately with the sifted flour - mix well. Add the chopped nuts and marmalade and mix well. Pour the batter into the prepared loaf tin and bake at 170 for 1-1¼ hours. Cool in the tin for 10 minutes before removing to a cake rack to cool completely. Optional: To make this loaf extra tangy I sometimes add about a tablespoon of chopped crystallised ginger. THIS is a really old-fashioned soup that was very popular in Britain when I was growing up. I had forgotten all about it until recently when I was going away on holiday and had a large head of celery to get through before we left. This is really a most delicious soup and very simple and cheap to make, especially if you have lots of celery in your garden. In a large saucepan heat the oil gently and add the sliced celery, onion and garlic to the pan. Cook over a gentle heat until the vegetables are soft but not browned. This will take around 15 minutes. Add the chopped parsley and vegetable stock then season well with nutmeg and black pepper. Simmer the soup for about 15 minutes then pour into a blender or food processor along with the single cream. Process/puree at high speed till soup is smooth and creamy. Butter four pudding bowls or 1 x 1litre larger bowl. Sift flour and baking powder and fold into mix alternately with the milk. Use 200grams of the berries to layer the base of each dish (or 1 big dish). Top with the pudding to ¾ full. Seal with foil and tie with string. Stand in a baking tray with boiling water halfway up sides. Bake for 35-40 minutes until firm on top. (You may need a few extra minutes for the larger bowl). Serve this dessert with rich, thick cream or warm custard. These are a real treat – spoil yourself! EACH winter I look forward to making tasty, warming soups and slow-cooked stews. Each year I try out new ideas for soups and eventually come up with an outright winner for the year. Last year it was the celeriac and potato soup. Celeriacs are those strange, knobbly, slightly pear-shaped vegetables that look a bit like a goblin’s head with green hair. Don’t be put off by the appearance of this versatile vegetable. Celeriac are good raw; finely chopped in salads, and are delicious in those lovely warming winter stews and as an addition to mashed potato. They are low in fat and a good source of Vitamin C.
Celeriac will discolour quickly so, when preparing, drop them into a pan of water and add a squeeze of lemon. This is from a recipe by Bill Granger. Heat the butter and olive oil in a large, heavy-based saucepan over medium-low heat. Add the leek and sprinkle with a little salt, then cook, stirring occasionally, for 3-4 minutes until soft. Add the potato, celeriac and stock. Increase the heat to high and bring to the boil. Reduce the heat to low and simmer for 20-25 minutes with the lid on, until the potato and celeriac are tender. Remove from the heat and leave to cool slightly. Puree the soup either in a blender, in batches, or with a stick blender until smooth (a few lumps always add interest). Return to the pan and stir over medium heat until heated through. Taste the soup and season with salt and white pepper if necessary. Ladle into bowls, then swirl a spoonful of yogurt or cream on top and sprinkle with the parsley. WE’VE been enjoying lots of fresh figs this year. They’ve been so much cheaper than in previous seasons and are so versatile served either as a dessert, or our favourite fig dish, baked with blue cheese with a salad or as an entrée. Native to the Middle East, fresh figs have enjoyed perfect conditions this summer. The fig tree is thought to be the first crop to be domesticated for human consumption, well over 11,000 years ago. The fig was prominent in Greek, Egyptian and Roman culture, and of course, is famous for its association with Adam and Eve in the Bible. Arrange figs (halved or quartered) in a buttered dish. Sprinkle with 2 tablespoons of sugar and the orange juice. Bake for 20 minutes at 200 degrees basting with juices. Add walnuts and remaining sugar. Turn oven down to 150 degrees and bake for a further 10 minutes. Add the honey and orange flower water to cooking juices in a saucepan and warm over low heat. Serve warm or cold with yoghurt. Preheat the oven to 190 degrees and line a baking tin with paper. Trim the figs and cut a cross in the top. Gently squeeze the top of each to open slightly. Place a small piece of blue cheese in each cross. Wrap a slice of prosciutto around each fig. Place on baking tin and bake for 10 minutes. Make a sauce by heating the cream gently in a pan and whisking in any remaining cheese. 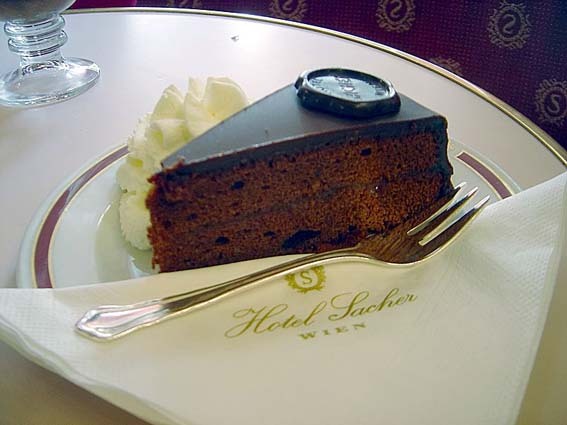 SACHER Torte, a very delicious moist chocolate cake, originated in Vienna and was first served at the Hotel Sacher, where to this day you can still order a piece of for morning tea. The best thing about this cake is that it gets better if you make it one or two days before you need it. This recipe will be ideal for Easter if you plonk a few mini chocolate eggs on the top. On the day of serving, simply make the chocolate ganache and pour it over the top and let it set. It is quite an expensive cake to make, which is why I make it for extra special occasions, such as birthdays and Easter. Preheat the oven to 180C. Grease a deep 23cm round cake tin then line the base with baking paper. Beat the butter in a bowl until really soft, then gradually beat in the sugar until the mixture is light and fluffy. Add the egg yolks, then fold in the ground almonds and sieved flour. The mixture will be quite thick at this stage. In a separate bowl, whisk the egg whites until they are stiff but not dry. Add about one-third to the chocolate mixture and stir in vigorously. Gently fold in the remaining egg whites. Bake in the oven for about 45-50 minutes, or until well risen at the top and the cake springs back when lightly pressed with a finger. Leave to cool in the tin for a few minutes then turn out, peel off the paper and finish cooling on a wire rack. Heat the apricot jam in a small pan and then brush evenly over the top and sides of the cold cake. Allow to set for a few minutes. Make the ganache by breaking the plain chocolate into pieces. Heat the cream until piping hot, remove from the heat and add the chocolate. Stir until the chocolate has melted, then cool till a coating consistency. Then pour the icing on to the centre of the cake. Spread it gently over the top and down the sides, and leave to set. When set, decorate with miniature Easter eggs. Everybody, including the children, will love this cake! In 2012, my husband, Bert, planted garlic for the first time. Apparently you have to plant it on or near Anzac Day for best results. In December 2012, we harvested the crop and he put aside some garlic cloves to sow for the following year. We have just harvested those and we have a wonderful crop of fat, juicy garlic bulbs. 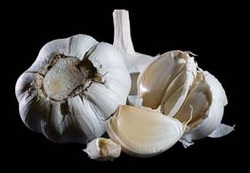 Forty cloves of garlic sounds far too garlicky, doesn’t it? Don’t be put off by the title of this classic French recipe. Because you don’t peel and chop the garlic, the flavour is softly muted and it is a delightful dinner party dish or even for that special occasion roast dinner. Wash the chicken inside and out and pat dry with a paper towel. Cut the lemon in half lengthways and place in the cavity of the chicken with the bay leaves. Tie the legs together with kitchen string to secure, then rub all over with the olive oil and sprinkle with the thyme or rosemary. Place the chicken in a large frying pan, add the garlic cloves, stock and wine and bring to the boil on the stovetop over medium heat. Put the onion and celery in the bottom of a casserole dish, put the chicken on top, cover with a lid and transfer to the oven for 1 hour and 10 minutes. Remove lid and roast for a further 20 minutes or until the chicken is golden brown. Remove the chicken from dish and set aside to rest. Use a slotted spoon to remove about 16 of the garlic cloves and set aside. Put the juices in a pan on the stovetop over high heat and simmer for 5-6 minutes to reduce to a sauce, pressing the garlic to release the flavour. Strain. Serve the roast chicken with the reserved garlic cloves and drizzle with a little sauce. WHEN I was young I hated beetroot, the sort that came out of a jar or tin. I was quite surprised when I arrived in Australia to find that here it was a much-loved vegetable. I eventually grew to enjoy the tinned variety in a salad sandwich. However, I much prefer my beetroot fresh from the garden, then cooked. My favourite way is to boil it in a pan for 30-40 minutes until it is tender, and then I sauté the beets in a little butter and a pinch of salt for a few minutes until well coated, then serve as a side vegetable. I love that earthy flavour. Wash beetroot. Cut off leaves at the top but leave the tail..
Roast for 45 minutes - 1 hour or until tender. 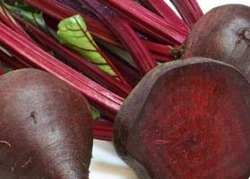 Wearing gloves, peel and discard skin from beetroot and cut into halves or quarters depending on size. Squeeze the garlic cloves over the peeled beetroot. Combine rocket or spinach, onion, feta, nuts and beetroot in a bowl. Place orange juice, oil and mustard in a screw-top jar. Season with salt and pepper. Secure lid. Shake to combine. Add to beetroot mixture. Toss to combine. EACH year, for as long as I care to remember, I have made a family Christmas cake, which is always very popular. I really enjoy the act of baking this special cake. A few years ago I lost my original recipe so had to hunt for a new one. This recipe from Delia Smith always turns out absolutely perfectly, as long as you follow her rather bossy instructions! Grease and line a 20cm round tin or 18cm square tin with greaseproof paper, and tie a double band of brown paper round the outside. Mix fruit and peel, with brandy, cover and set aside for 12 hours or overnight. Sift flour, salt and spices, lifting sieve high to incorporate air. Beat eggs together and add to creamed mixture a tablespoonful at a time. Keep the mixer running until all egg is mixed. Fold in the sifted flour – do not beat. Fold in the dried fruit, peel, nuts and treacle and lastly lemon and orange rind. Transfer to prepared tin and spread evenly. Cover the top of the cake with a double square of greaseproof paper with a 50 cent-size hole in the centre. Cool cake in the tin for 30 minutes. When the cake is cold, “feed” it by poking small holes with a skewer in the base of the cake at regular intervals and pouring over about 1 dessertspoon of brandy (this can be repeated weekly). Wrap in double greaseproof paper secured with elastic band, then wrap again in foil, or store in air-tight tin until Christmas. Ice as desired, or tie a Christmas ribbon around the cake to make it look festive. Growing broccoli is very rewarding because you get good results for your efforts. The problem is they all seem to come at once. I really prefer fresh broccoli to the frozen variety, so I’ve decided to look for more interesting ways to serve them other than plain boiling or steaming. This is just one of the recipes we have enjoyed recently. Add the pasta and cook according to the packet instructions, adding the broccoli for the last 3 minutes. Drain the pasta and broccoli, reserving ¼ cup of the cooking water. Heat oil in a pan over medium heat and add the garlic, onion and chilli. Cook for 3-4 minutes until fragrant. Add the anchovies and cook for 1-2 minutes until they start to dissolve into the sauce. Add the drained pasta, broccoli and reserved water to the pan and cook 1-2 minutes until heated through. Stir through the parmesan cheese and a drizzle of oil. Serve with a sprinkling of chopped parsley and fresh chilli strips on top. Cauliflower is not my favourite vegetable of all time. Boiled cauliflower is not very exciting and cauliflower cheese is fine, but I have been looking for a recipe that is different. I was very taken with this cauliflower mash, which you can serve instead of mashed potato. It’s very good indeed, and low in calories as well. Cook the cauliflower until it is very soft and drain well. Add salt and pepper, some butter and warmed milk (as you would for mashed potato), or cream or even yoghurt. Use a stick wand or potato masher to mash it all together. Try adding a little crushed garlic or grated parmesan cheese for extra taste. These two vegetables are so good for you and easy on the waistline too. We are big fans of marmalade at our house. I do love making it and seeing those gleaming orange jars on my pantry shelf. Many of my friends are big fans too and they always look forward to the jars I give them. 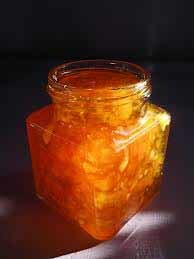 This marmalade is especially rich, and is a gorgeous colour. In fact blood oranges per se are quite delicious. If you juice them, they reward you with a wine-coloured juice that tastes wonderful. You don’t often see them in the shops but you may see them towards the end of winter or early spring, if you are lucky. I noticed that Woolworths in Wonthaggi have stocked them this year. Blood oranges are rich in vitamin C and the red pigment, anthocyanin, is an antioxidant. They may also diminish the risk of heart disease, some types of cancer, and LDL cholesterol accumulation. Additionally, they may reduce the risk of cataracts and aid in the body's healing process. Wow! Place the oranges in a large glass bowl. Pour over the water, cover and set aside to soak overnight. Transfer to a large stock pot. Bring to the boil over high heat. Reduce heat to medium and simmer, covered, for 45 minutes or until the oranges are tender. Add the warmed sugar and vinegar and stir to combine. Bring to the boil and cook, stirring occasionally, for about 30-40 minutes or until mixture thickens and is at setting point*. Stand marmalade for 15 minutes before pouring into sterilised jars. If using rosemary sprigs, stir them into the marmalade just before pouring into jars. Jan Cheshire's column has provided me with addition recipes for my "guys only" cookbook on several occasions. This book is my list of easy things to make when my partner is not home to spoil me. I think there is a pressing need for a bachelors’ cook book, something that is not too complicated for our simple ways in the kitchen. Any ideas along this line, Jan? I would have liked to have had a go at her blood orange marmalade ( September 14) but was not quick enough and now will have to wait for next season’s crop to hit the market. The same happens with Seville oranges but we have a friend who covers that with her homegrown fruit. Encouraging to hear Jan also uses CSR jam-making sugar. I won't feel so guilty in future. This is also stocked by most IGA stores, which I prefer to support over Woolworths or Coles whenever I can. Like Aldi, they don't always stock what you need but we are told they are the good guys in the supermarket wars so they are my first point of call. A cookbook for guys – that’s a great idea, Bob. There are lots of really simple recipes for soups, for instance, and rustling up a good curry or pasta dish is quite easy too. Good on you for attempting the marmalade. I noticed this year that some of the supermarkets were selling blood oranges, which they have not done before, so that’s a good sign. As you say, Seville oranges are harder to find. If I miss out on them I make the marmalade with ordinary oranges and substitute a couple of lemons for that extra zing you get from the Sevilles. The jam making sugar is pretty foolproof, which is why I use it, as things don’t always go strictly to plan when making jams and marmalades! It’s good to know that someone is trying my recipes and I do try to keep them simple and easy because that’s the way I like to cook. THE first lemon tree we planted in our new garden did not thrive despite all our efforts. Finally we had had enough and bought another tree which has gone from strength to strength and now in its first year of produce has six good-sized lemons with more to come. 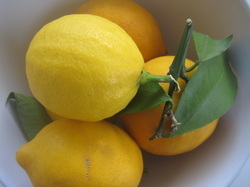 I use lemons a lot for cooking and detest having to buy American lemons when our own varieties are not in the shops. I first made this cake many years ago from a recipe in a school cookery book put together by the mothers. In that book this recipe was called Canadian Lemon Cake. These days it’s often called Lemon Drizzle Cake, and you will see why. It is the most delicious cake and is always a hit wherever I take it – and I do take it to quite a few places! If you like lemon flavours you’ll love this cake. Cream the butter and sugar and add the grated lemon rind and juice. Fold in the sifted flour and baking powder alternately with the milk. Bake in a preheated 190c oven for 10 minutes. Reduce temperature to 180c for a further 40-50 minutes. While the cake is cooking, mix the juice and rind of 1 lemon with ½ cup of caster sugar and set aside. When the cake is cooked, remove from the oven and immediately pour over the lemon mixture. Leave in the tin until completely cold. Take care removing from the tin – if necessary, slide a knife around the edges of the tin. This cake is also delicious as a dessert served warm or cold with cream or ice cream. It also freezes well. RECENTLY, I spent a week in Sydney looking after my three grandchildren while my daughter was away for a few days. The eldest, Izzie, is 10 and really enjoys her food. She declared that her very favourite dinner was chicken pie, so I thought I had better brush up on my chicken pie skills . When we got home from our trip we found lots of good-sized leeks in the garden. As I am rather partial to them, I decided to make a chicken and leek pie, thereby getting some pie practice in before the family descend upon me next school holidays. Here is that recipe. If you don’t like leeks, you can make this with 125 grams of button mushrooms. In a large frypan, add half the olive oil and lightly brown the cubed chicken, then set aside. Using the same frypan, and the remaining oil, sauté the leeks until tender. In another large pan, make the white sauce by melting the butter then mixing in the flour to make a roux. Once the flour is mixed in, add the warmed milk and stir until smooth and thickened (this is best done with a hand whisk). Add the chicken and leeks and cook over a low heat for 10 to 15 minutes. Spoon in the chicken and leek, moisten the edges and cover with the 2nd sheet of puff pastry. Brush the top with egg and milk. Bake in the preheated oven for approx 15-20 mins or until golden brown. SOME people call kale a "superfood"; others say it has been superseded by other "supergreens". As the child of a German mother, I’ve been eating Grünkohl (brassica oleracea) for as long as I can remember, well before it became fashionable. 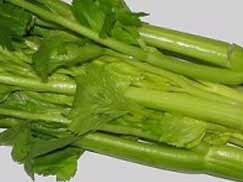 In fact, it has been a common vegetable in Europe since the 4th century BC. Most communities in the northern part of Germany still celebrate an annual kale festival where the annointed Kale King and Queen preside over a community feast of kale dishes. And yes, imagine the umpapa band, swirling dirndls and much wheat beer! There are even bus trips "into the blue" where you won't know where you're headed but are assured of a delicious kale feast. 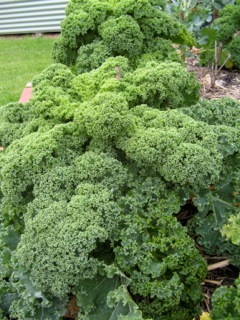 Kale is fairly resistant to disease and insects so it’s a good vegetable for the home garden. You only take what you need as in side stalks for stir fries, frittatas, juicing or soups (it is a must for an authentic-tasting minestrone) and it will keep on producing leaves. How can one not love such a generous plant! Or cut the whole head for larger quantities and create a delicious vegetable, similar to creamed spinach. We lack the ongoing frosts that bring out a flavoursome sweetness, but I have had good results by placing the kale in the freezer overnight, or even for an hour or two, before cooking. If serving as a vegetable, it goes well with roast pork or duck, but on its own, together with fried leftover potatoes, is a winner in the comfort food stakes. The following recipe is meatless but if you prefer a smoky flavour, just place whatever you choose in the pot and cover with the kale. Wash the kale and strip leaves off the thicker part of stem. Place in a large pot with boiling salted water and simmer for 10 minutes. Drain well and chop finely. Heat the oil/dripping and fry the onion until it starts to brown. If you are using meat, add it now. Add the chopped kale, stock, oats or potato, and salt and pepper to taste. Bring to boil, then simmer for one hour, stirring occasionally. You can add more or less liquid. If the oats/potato has not thickened it enough, you could add a flour roux. ALTHOUGH pumpkins are available all year round in the supermarket in Australia, I can’t help feeling very pleased when we find the odd self-seeded pumpkin growing happily in the garden. The humble pumpkin is such a versatile vegetable. Whether you like it sweet and crunchy around a traditional Sunday roast, or as a creamy winter soup, or even in a spicy fruit cake. And of course I can’t miss out the pumpkin scones. It’s a great favourite with young and old alike. This soup is a different take on the more traditional variety as it does introduce a bit of zing. It’s truly warming and delicious for a cold winter’s day. Add pumpkin, carrot and garlic and cook gently for 5 minutes. Add the curry paste. Cook, stirring, for 1 to 2 minutes or until fragrant. Add coconut cream, and cook, stirring, for 1 minute. Add 2 cups cold water. Bring to the boil. Reduce heat to low. Simmer, covered, for 20 minutes or until the vegetables have softened. Blend or process soup in batches until smooth. Season with salt and pepper. Top with coriander and sliced red chilli if using and serve. NETTLES are everywhere at the moment, bright and tender. I gather them while I can, before they grow dark and bitter. 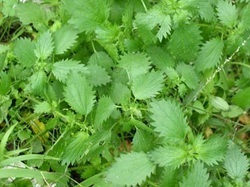 Nettles are held in high esteem in Italy as one of the first and tastiest vegetables of spring. The famous River Café in London uses them to make pasta, which they serve very simply with butter and cheese. I came to nettles via a different route, as a possible palliative for arthritis. It was my old neighbour Jim Bell who put me onto them. Jim was born in Wonthaggi in 1922, but his parents grew up near Walhalla. He told me a story his father had told him, of a couple of old Chinese men who’d spent decades panning for gold in the streams and creeks up there, warding off the rheumatics (an occupational hazard of such wet work) with potfuls of stinging nettles. I did some research and found nettles are indeed regarded in many parts of the world as a cure or palliative for arthritis. As a plumber, Jim himself had awful arthritis – he’d had two knees and various other bits replaced and his fingers were twisted and gnarled – so I decided to test the efficacy of the cure on him. His garden was full of nettles, a sign, apparently, of healthy balanced soil. I found a Swedish recipe for nettle soup on the internet, put on the rubber gloves and picked a big bag of nettle tips and cooked them up. As the soup came to a gentle boil, I was intrigued by the bright green colour and a subtle, complex aroma. I tasted it, expecting it to be medicinal and bitter, and found it delicious! When I took a batch over to Jim, he looked dubious. I doubted that he would actually eat it – he was an old-fashioned meat-potatoes-and-veg Aussie. He didn’t mention the soup again so I assumed he’d thrown it out. About a week later, I was in town when a couple of his old friends, Hilton and Nessie Jupp, came rushing up to me. “How did you make that soup?” Nessie demanded. “He didn’t want you to feel you had to keep making it,” Nessie said. I checked with Jim, who confirmed the reports. He said the most miraculous effect was on an arthritic finger. This finger was so painful that he’d begged his doctor to chop it off, which the doctor refused to do. The day after he’d had the soup, he said, the pain was gone and he could move the finger without discomfort. After that, I used to cook up a big batch of soup when the nettles were at their best and freeze it so Jim could have the soup whenever his pain was bad. No promises but here’s my recipe. I figure anything that green has to be doing some good. At the very least, it’s delicious! Pick as many bright young nettle leaves as you can. Unless you’ve got leathery old skin, you’ll need to use rubber gloves. The thin latex ones are best. I find it easiest to cut off the tips into a colander then you really don’t have to handle them. Rinse nettles if they’re dirty. 1. Chop onion, sauté in butter/oil until soft. 3. Add chicken stock and pepper and salt and bring to a simmer. 4. Add nettle leaves and simmer for a couple of minutes until soft. 5. Add pepper and salt and puree. Reporting on “Nettle Soup”. Wow! dreadful stuff to taste, but the results seem to be as comments re “Jim” All I know is I am feeling considerably better, (if one can be better at 92 years old) The taste is like nothing I have ever eaten before in my life, but I am quite prepared to keep going for another week. Thanks for the interesting articles. THREE years ago we planted two apple trees in our new garden; a pink lady and a granny smith. My husband, Bert, espaliered them and this year, much to our great delight, we’ve had a wonderful crop of apples. I love apples and my favourite dessert is apple pie. However this cake is particularly scrumptious, It’s simple to make (you don’t even need a mixer) and delicious as a slice of cake for afternoon tea or as a dessert with custard or ice cream (or both, as Bert would insist). Preheat the oven to 190 degrees. Grease and line an 18cm springform tin. Melt the butter. Remove from heat and cool slightly. Stir in the sugar, flour, egg and salt. Mix to a soft dough. Place 2/3rds of the dough into the base of the tin, pressing out gently to cover. Mix together the apple slices, dried fruit, extra cinnamon and Demerara sugar then arrange in tin. Place the remaining dough over the top in little clumps, press down lightly. Bake for approximately 1 hour until golden brown on top. Cool in the tin for 20 minutes then transfer to a plate. WHEW! It’s been so hot and dry in the garden but magically most plants seem to have survived the lack of rain. It is certainly lovely to have some cooler evenings at last. The new season’s Shepard avocados have been great, with their firm, creamy, flesh and the fact that they don’t so readily turn brown when cut. I do love them and enjoy them as much as I can, especially as an alternative to butter and margarine spreads on sandwiches. This very tasty and simple salad recipe was given to me by my daughter; the dressing is quite different, and the salad makes a great side dish for steak, fish, etc. You can cook the chickpeas yourself according to the directions on the packet or, like me, use a can drained and well rinsed. Whisk the lemon zest and juice, oil, cumin, salt, sugar and pepper in a large bowl. 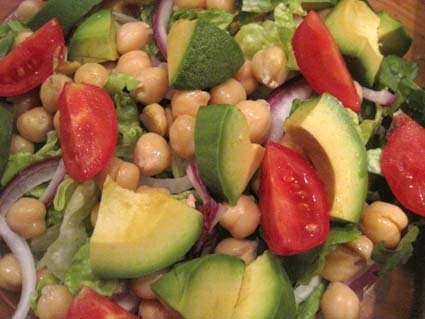 Add the chickpeas, cucumber, tomato, spring onions, parsley and avocado; toss gently to combine. 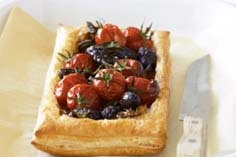 Serve immediately, or cover and refrigerate for up to 8 hours. Some crumbled feta or goats cheese is a nice addition to this salad. 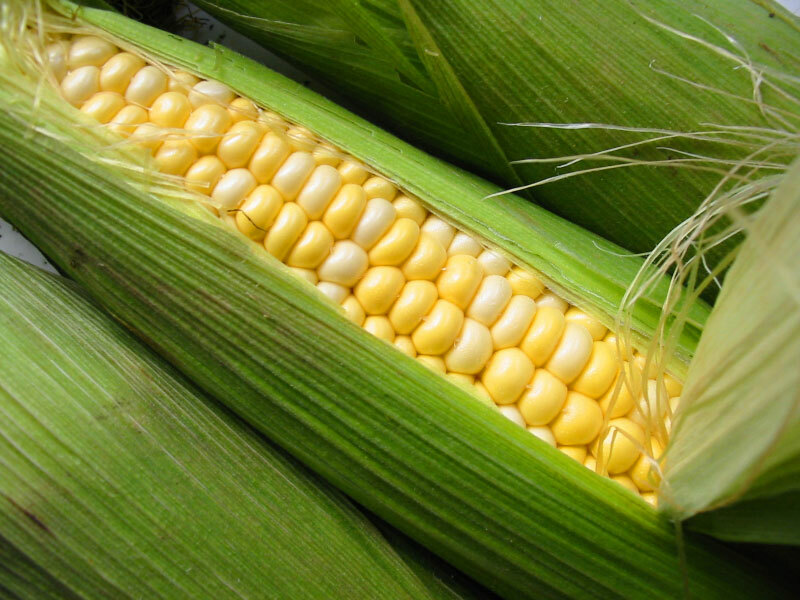 WE'VE had a bumper crop of sweet corn -- big, plump, juicy cobs despite the dry weather. Bert grew some variegated corn this year and this variety, with its pale yellow and white kernels, is exceptionally sweet and very creamy. Just boiling for about seven minutes in unsalted water is a great way to cook corn, but my favourite way is to char grill it either on the barbecue or in a char grill pan with a splash of olive oil, turning it frequently until it becomes golden and slightly charred. To serve, sprinkle over a pinch of chilli flakes and a good squeeze of lime juice, plus the obligatory big blob of butter. The plums have also been wonderful this year. I was so disappointed last year when they somehow did not materialise at my plum lady’s place along the Cape Paterson Road. This year she had varieties aplenty and they have all been delicious. This cake recipe was given to me by Nola, an acquaintance of mine. It’s been a great favourite whenever I have made it. It makes quite a large cake, but you can freeze any leftovers. It also makes a scrumptious dessert served with a generous dollop of cream or ice cream. Add the beaten eggs, sour cream and lemon juice and beat well. Fold in the flour, bicarbonate of soda and baking powder sifted together. Pour half of this mixture into a greased and lined 23-centimetre round cake tin. Cover with half the plums and nuts. Add the second half of the cake mixture. Cover with rest of plums and nuts. Bake at 180 degrees for 90 minutes or until a wooden skewer inserted in the centre comes out clean. Cool on a baking tray for 30 minutes before carefully turning out. FOR the last couple of years our tomato crops have not been that wonderful, so I am hoping for a bumper crop this season. As well as using the lovely red orbs in salads and sandwiches, I like to make lots of fresh pasta sauce which will last us well into winter. I freeze the sauce in snap lock bags as they take up less room in the freezer and defrost by putting the bag in a bowl of warm water for a few hours, or in the microwave for speed. This is great for pasta sauce, chilli con carne and any tomato-based sauces. Here is my recipe for pasta sauce. Tumble chopped tomatoes with oil, garlic and onion. 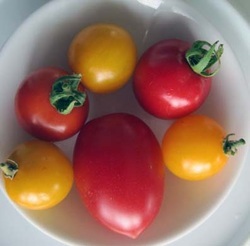 Put into a saucepan with a tight-fitting lid, cook them very gently for about 20-30 minutes until the tomatoes have collapsed, skins are wrinkled and golden and the juices are flowing. Alternatively, spread them into a baking dish where the tomatoes will fit quite snugly and bake at 180 degrees for about 1 hour. Season to taste. Try adding fresh herbs such as basil, oregano, rosemary, parsley and bay leaf. If using basil, toss that in after the sauce is cooked. Throw in a whole sliced chilli for a spicy sauce. You can make the pasta sauce richer with the inclusion of some chopped bacon and mushrooms, or carrot and celery and a splash of red wine from the beginning of cooking time. When cool, pour into medium sized snap lock bags and specify on the label which herbs have been included. HELP! What on earth am I going to do with all those zucchinis? A frequent cry in my house at this time of the year. 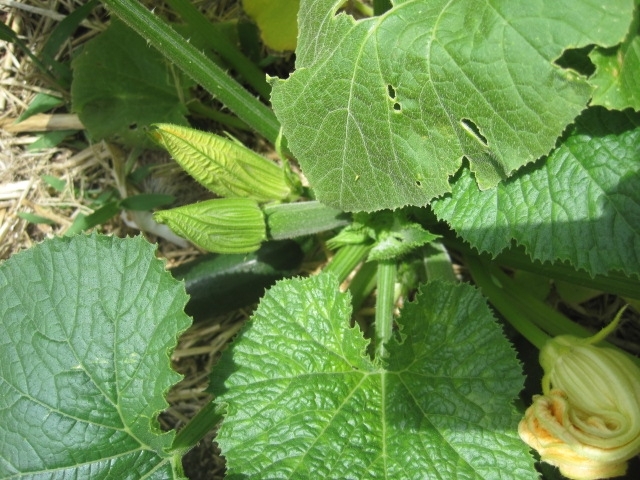 As Bert, my husband, tells me, today there are some young zucchinis in the garden, tomorrow they will be large ones, the next day they will be marrows. It’s important to catch them early to get their real flavour. This is a very simple and tasty way of cooking the sweet, young zucchinis. Serves 4 people as a side dish or at a barbecue. Mix all marinade ingredients and add sliced zucchini and toss around until coated. Heat a BBQ grill or a char grill pan and fry for about 1-2 minutes each side until browned. Marinate zucchini and fry or grill for a tasty side dish. When the small zucchinis threaten to turn into marrows, I make this deliciously spicy cake. I liken it to a carrot cake as it is made in a similar way and is very moist. Preheat the oven to 180 degrees. Grease and line a 22cm springform tin. Sift flour, baking powder, bicarbonate of soda, cinnamon and nutmeg into a large bowl. In a separate bowl mix sugar, vanilla, eggs, and oil together. Fold the egg mixture, grated zucchini, sultanas and nuts into the flour mixture. Pour into the prepared pan and bake for 1- 1¼ hours until a skewer inserted into the centre comes out clean. Cool in the pan for 5 minutes then transfer to a wire rack to cool completely. This is an adaptation of a recipe from ABC Delicious magazine, February 2012 edition. AREN'T the mangoes wonderful this season? It’s so good to have them that little bit earlier from the Northern Territory. Mangoes have never been my special favourite, but this year the flavour has been so good I’ve changed my mind. Apart from being cool and refreshing on their own, they marry especially well with pork. I had a piece of pork fillet in my fridge and decided to cook it and serve it with a mango salsa, which was the perfect match for such a delectable fruit. The pork fillet weighed about 600 grams; I trimmed it, rubbed it with olive oil and salt and pepper and a cut piece of garlic and left it to marinate for a couple of hours. I pan-fried the pork in a lightly greased pan, until it was nicely seared, then popped it in the oven at 180 for about 20-30 minutes until it was cooked through. I let it stand for 10 minutes covered with a piece of foil, before slicing it thickly. With Christmas coming up, this salsa could make a nice Australian-type accompaniment for a roast pork loin instead of the usual apple sauce. Give it a try. I certainly will! Needless to say mangoes are excellent for your health, being full of fibre and vitamins A and C.
Enjoy! And a merry Christmas to all Bass Coast Post readers. I KEEP peeking at our strawberry patch and yes, they are in flower and I can see some small, green (as yet) berries. I can’t wait for them to turn red, then I can sneak out early one morning to pick a ripe strawberry and taste the early morning sun on it. Oh joy! Strawberries are one of the healthiest fruits to eat. They are full of antioxidants and other essential nutrients that help reduce your risk of cancer, heart disease, inflammatory diseases, as well as managing your weight. There are so many recipes for strawberries. However, just serving with lashings of thick cream is heaven and made even more so if you add a few blueberries. They do seem to go very well together. This recipe is a blast from the past, really, but I think it’s a gorgeous and very simple dessert dish for a special occasion. The creator of this heavenly dish is thought to be Marie-Antoine Careme, who was chef to the Russian ruler Nicholas I from the Romanoff family. When ready to serve, whip the cream, place the strawberries and liqueur in some special glass bowls and top with lashings of cream or ice cream. This is very decadent – but very, very nice. 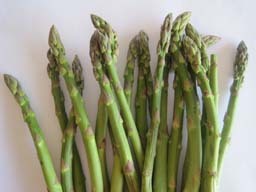 ASPARAGUS is very much in season at this time of year. To me it’s the king of vegetables. We’re very lucky to live near Koo Wee Rup, an area famous for its asparagus. When buying asparagus, make sure the heads are tight and the stems are firm. To prepare, break the stalks by bending them at the point of least resistance, usually about two-thirds of the way down the stem. The bottom bits are too woody to eat but you can use them to flavour soups. Asparagus doesn’t require any fussy cooking and is at its best prepared simply to enjoy its unique fresh flavour. I love it blanched in boiling water for two minutes, then char-grilled in butter for a few minutes until it's slightly coloured, and served with a squeeze of lemon juice and grated parmesan cheese. As an alternative, you can wrap pieces of prosciutto around each asparagus stalk and char grill until the prosciutto is crisp. This vegetable is an excellent source of fibre, folate, vitamins A, C, E and K , packed with antioxidants, and is among the top fruits and vegetables for its ability to neutralise cell-damaging free radicals. Some claim asparagus may even help slow the ageing process. When they are home-grown, broad beans come into their own, tender, sweet and nutty. Gently remove them from their cosy cushioned pods and throw them into boiling water or steam them for a few minutes. In Tuscany they peel off the next layer of skin and eat the young uncooked beans with pecorino (or parmesan) cheese. I don’t usually peel off the second skin; I find that just boiling or steaming then serving with lots of butter and parsley or mint is best. However, my favourite way to eat broad beans is in a salad. I cook the beans then leave them to cool. Meanwhile, I prepare a salad of green leaves and rocket ,add some chopped mint and scatter with the cooled broad beans. I make a dressing from red wine vinegar and extra virgin olive oil and add a little lemon juice and salt and pepper. They are very versatile and also taste great in this dip. Put all ingredients into a food processor and blend on low power until thick and creamy. Taste, then add salt and pepper and adjust the amount of garlic, mint and lemon to taste. Broad beans are very low in saturated fat, cholesterol and sodium, and a good source of dietary fibre, protein, phosphorus, copper, manganese and folate. My elderly Greek neighbour used to make a beautiful dish with unpodded young broad beans. This is good when you’ve been watching and waiting for your broad beans to mature and decide you can’t wait one more day. Only use immature pods for this, with very small beans inside. Top and tail pods and string any that look as if they need it. Cut bigger pods into bite size. Sautee an onion/leek and garlic in olive oil until soft. Add about half a cup of water, bring to simmer and add prepared beans and chopped herbs (eg. dill, parsley, oregano, mint). Cover and slow-cook on the lowest possible heat for an hour or more. Add pepper and salt, a slurp of olive oil and lemon juice to taste. Lemon zest is good too, if you like it. Serve at room temperature.